UFC 229 will break the mma pay-per-view record, will it break the book? UFC 229 fight will take place this weekend, Saturday, Oct. 6th, 2018 inside T-Mobile Arena in Las Vegas, Nevada. The main event features the Lightweight Title fight between Conor McGregor vs Khabib Nurmagomedov. Khabib is the current Lightweight Champion.Conor was stripped of the Lightweight Championship due to inactivity back in April 2018. This fight will settle who is the legitimate UFC Lightweight Champion. With all the hype this UFC 229 is set to break the MMA pay-per-view record. So, unless you’re a celebrity and have $10,000 to burn to sit ring side, which buys you a cool VIP folding chair to take home (more on this later). You will likely need to pay to watch this fight on PPV. Why not enhance your fight night and win back the money you’re out from the Pay-Per-View? 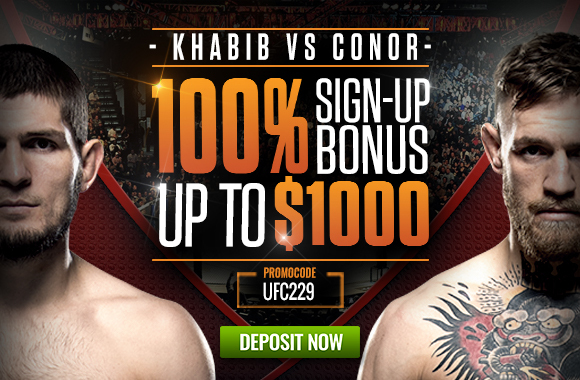 To receive this 100% Sign-up Offer you must use promo code UFC229 in the cashier section and make a deposit of $100 or more. Keys to Victory: McGregor’s defense is very good. He can stay calm in uncomfortable positions. His striking is better in every way. He’ll have to keep his distance from a takedown and use his legs more than his fists. Important notes: Minimum deposit of $100.00 or more to trigger offer. Make sure you click “Yes” under “Claim a Bonus?”, then confirm “Yes”, then click “Add a Promo Code” and enter the code into the box. Then click the green “REDEEM” button in the cashier to activate it. Offer expires on October 10th at 23:59 ET.